– Digestive problems: dyspepsia, problems with the liver, prevention of gallstones (but not in treatment), anorexia, prevention of urinary stones, acne. 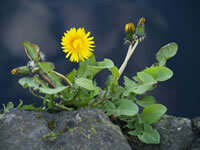 – Around 1/2 to 1 teaspoon (3 to 4 grams) of whole dandelion plants (including the roots). – Put the 1/2 to 1 teaspoon (3 to 4 grams) of whole dandelion plant in 6.76 fl. oz. of cold water. – Boil for about 15 minutes. – 1/2 to 1 teaspoon (3 to 4 grams) of whole dandelion plant in 6.76 fl. oz. (200 mL) of cold water.